Aside from sun and sand, South Florida is known for its aggressive personal injury bar. It remains an epicenter for excessive and fraudulent auto insurance litigation and tobacco lawsuits. Florida lawmakers have made recent progress in addressing the excessive liability exposure to slip-and-fall, automobile “crashworthiness,” and medical liability claims that contributed to South Florida’s reputation as a Judicial Hellhole. Yet much more needs to be done, particularly in ridding the state of a rule that does not subject junk science to judicial scrutiny. Florida drivers pay extraordinarily high insurance rates and one of the reasons is a “personal injury protection” (PIP) system that encourages litigation, permits high attorneys’ fees, and allows rampant fraud. South Florida was the original epicenter for such fraud, which has now spread to the Tampa and Orlando areas, according to the National Insurance Crime Bureau (NICB). In fact, NICB respectively ranks South Florida (Palm Beach, Broward and Miami-Dade counties) and Tampa Bay as the second worst and worst PIP-fraud regions nationwide. While PIP coverage was intended to lead to quick no-fault recovery of up to $10,000 for basic medical expenses without litigation, it has morphed into quite the opposite. There are several reasons why. The first reason is excessive attorneys’ fees that dwarf medical expenses. When a medical clinic that treats a person with a PIP claim does not receive full compensation for its bill from an insurer within 30 days, lawyers send a demand letter to the insurer demanding that they pay within an additional 30 days. Then they sue. Especially in South Florida, lawyers fight over amounts as small as $1, and then are entitled to collect thousands of dollars in legal fees. If an insurer is suspicious about the validity of charges and fails to pay, it risks such a lawsuit. Some unscrupulous Florida personal injury lawyers have reportedly submitted inflated bills for 26-hour days, meetings with the dead, or meetings that otherwise never took place. Meanwhile, patients may not even know that a lawsuit was filed. NICB lists Florida as the number one state for staged accidents, with nearly the combined total of the next two highest states, New York and California. Three of the top five cities for staged auto accidents are in Florida – Tampa, Miami, and Orlando. The basic scam involves a fake crash in which a number of people, who may or may not have been in the car, are supposedly injured. The accident “victims” go to clinics that are complicit in the fraud. They fill out paperwork indicating the individuals received treatment for their injuries, even if they did not. Those who are recruited to take part as fake victims may be the unemployed, recent immigrants and others in need of money. They sign over their legal rights to the clinic to collect the medical expenses on their behalf. In other cases, a clinic may simply demand that an insurer pay for diagnostic tests that were unnecessary or never performed. Unsuspecting Floridians also get caught up in this racket. As last year’s Judicial Hellholes report went to press, the Miami New Times provided an expose on the case of a Trinidad immigrant, Ganesh Sohan, who called “411-PAIN,” after television commercials suggested he was entitled to $10,000 for his car accident-related injuries. But he says he ended up with unnecessary tests, treatment, legal fees and debt. Insurers have called PIP “the driving factor” behind rate increases “due to both worsening loss trends and increased fraud activity.” Government officials agree. Insurance regulators attribute Florida’s skyrocketing auto insurance premiums to “the large number of PIP lawsuits and resulting expenses….” State Chief Financial Officer Jeff Atwater has observed that auto insurance fraud costs the average Florida family an additional $400 per year. Regulators say “the filing of [PIP] lawsuits is out of control.” In April, the Florida Office of Insurance Regulation issued the latest report offering renewed confirmation that this costly auto accident fraud is on the rise in Florida. Robin Westcott, the Office of Insurance Regulation’s director of Property and Casualty Financial Oversight, has predicted that “you will see carriers leave the state,” if the abuse continues unchecked. Lawmakers in Tallahassee have acknowledged the growing problem but have not yet taken action. particular language of the advertisement he or she saw and the details of his or her discussions with staff members. Since the Florida Supreme Court’s 2006 decision in the case known as Engle, Florida has become a hotbed for tobacco litigation or, as a St. Petersburg Times editorial headline called it, the “center of [the] tobacco litigation universe.” The reason? The Engle decision preserved findings in a class action lawsuit that place two strikes against defendants, leaving juries in individual-smoker cases to consider only whether smoking actually caused the plaintiff’s illness, comparative fault, and damages. While tobacco trials are not representative of other types of lawsuits, the outcome of such suits gives a sense of an unpopular civil defendant’s chances in Florida courts. As of mid-November 2011, Philip Morris won nine of the past thirteen Engle cases that went to trial. Overall, plaintiffs have won two-thirds of the 53 post-Engle trials, and the recent tobacco-defendant victories reverse a trend started just two years ago when defendants lost thirteen cases in a row. This year, cigarette makers won cases in Miami-Dade, Palm Beach, Clay and Lee counties, among others. They do not appear to be faring as well in Broward County, where one recent verdict came back with a relatively small $86,000 sum, but where a 2009 case resulted in a stunning $300 million award (it was later reduced to about $38 million). Whether this record reflects the location of the court, the facts of the individual case, the luck of draw, or the skill of the lawyers is not yet fully evident. Also this year, the Fourth District Court of Appeals, which oversees South Florida courts, questioned the constitutionality of the structure of a post-Engle trial. Chief Judge Melanie G. May issued a stinging concurrence, which questioned whether Engle can be applied as written without violating due process. “[A] lurking constitutional issue hovers over the poker game [in which trial courts must play the cards Engle has dealt them]: To what extent does the preclusive effect of the Engle findings violate the manufacturer’s due process rights?” she asked. Unless a court intervenes or the parties settle, these suits will continue on for the foreseeable future. One source estimates that it will take approximately 250 years for Florida courts to get through the lawsuits even if just 5,000 of the over 8,000 lawsuits filed go to trial at the current rate. 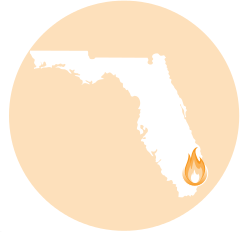 On the bright side, and as noted above and in the Points of Light section, the Florida Legislature took several positive steps this year to address areas where liability exposure in the state was out of the mainstream. Most significantly, legislators overturned a 2001 Florida Supreme Court decision that prevented juries from learning, in cases in which a plaintiff alleged that a car did not sufficiently protect him or her during an accident, that the driver was under the influence of drugs or alcohol or asleep at the wheel. This victory adds to 2010 gains in which the legislature addressed excessive slip-and-fall liability, government hiring of private lawyers to enforce state law on a contingency-fee basis, and the authority of parents to sign waivers allowing their children to participate in activities with inherent risks. A bill that would have added Florida to the vast majority of states that have adopted standards for the admissibility of expert testimony on par with the federal courts passed the House, but stalled in the Senate. Another bill, to rein in excessive PIP car accident litigation and fraudulent PIP claims also failed. Legislators are expected to take another crack at these necessary but still outstanding reforms in 2012. Of course, even when common sense tort reforms are enacted in Florida, they remain subject to a “veto” by the Florida Supreme Court, which has sometimes viewed them as legislative intrusions into the judicial domain. For instance, this year the court ruled that a law requiring those who bring asbestos or silica claims to show an existing physical injury before bringing a lawsuit could not constitutionally apply to those who received an often questionable diagnosis before the law took effect. So long as a plaintiff can show evidence of exposure in the lungs, the court found, earlier plaintiffs could sue even when there is no impact on day-to-day life. The law addressed the fact that up to 90 percent of recent asbestos plaintiffs have no physical impairment that affects their daily activities. Many of these claims have been generated through unreliable mass screenings. The preponderance of the non-sick on court dockets and in settlement negotiations diverts legal attention and resources away from the claimants with severe disabilities. Observers are also closely watching for the state high court’s ruling on a challenge to a law enacted in 2003 that limited damages for pain and suffering in medical liability cases to $500,000 in most cases and $1 million in cases of catastrophic injury or death. Such laws are aimed at increasing access to affordable healthcare by ensuring that those who are harmed by medical errors receive full compensation for their medical expenses and a reasonable amount for pain and suffering, without imposing excessive liability on health care providers. While most state courts have upheld such limits, the Florida Supreme Court struck down a similar law, along with a package of other reforms, in 1987. Also this year, an appellate court affirmed Miami-Dade Circuit Court Judge Gerald D. Hubbart’s decision to dismiss a lawsuit filed by a California resident who booked a vacation through a Washington-based company and claimed she was assaulted during a trip to Mexico. In that instance, the trial court had properly found that the plaintiff was able to receive a remedy in Mexican courts, where the evidence and witnesses are located. More importantly with respect to future cases, the appellate court found that since the plaintiff was not a Florida resident, her choice to sue there was not entitled to substantial deference. Such rulings can help discourage plaintiffs from all over the country from suing in what many personal injury lawyers view as Florida’s favorable courts. In addition, a Florida Supreme Court action on a disciplinary matter this year may lead lawyers to pause before engaging in unethical conduct. Last year, we reported that the Florida Supreme Court temporarily suspended the law license of Hank Adorno in connection with an alleged violation of rules governing attorney conduct as it considered his case. The court’s action followed the finding of Broward Circuit Judge Jack Tuter that Adorno orchestrated a $7 million class-action settlement that benefited only seven people, rather than all the Miami taxpayers he claimed to represent. In the case, which challenged a city fire fee, seven plaintiffs split $5 million and the lawyers took $2 million instead of providing a refund to thousands of property owners. Adorno’s law firm, which dropped the co-founding partner’s name from its letterhead, returned $1.6 million in fees collected, but kept about $400,000. This April, the Florida Supreme Court, ruled that Adorno was guilty of ethical breaches, suspended him from practicing law for three years and ordered him to close out his practice. In so doing, the court rejected a recommendation that Adorno receive only a “public reprimand,” as well as the Florida Bar’s suggestion that he receive a six-month suspension, and adopted the most severe sanction short of disbarment.